Bundesliga - Borussia Dortmund 3 Bayern Munich 2 - Live Updates! Paco Alcacer came off the bench to score a wonderful winner as Borussia Dortmund completed a stunning comeback to down Bundesliga rivals Bayern Munich 3-2 in a brilliant Klassiker. Reus was recalled to the Germany squad this week and the Dortmund captain should have given the hosts an early lead, hitting a one-on-one chance straight at Neuer, who had conceded each of his last eight shots on target in the Bundesliga. Bayern punished slack Dortmund defending with the opening goal in the 26th minute, Lewandowski drifting between the centre-backs to head home Serge Gnabry's right-wing cross. Gnabry had space to shoot but instead backheeled a cute pass to Joshua Kimmich, the right-back's floated cross converted from close range by supreme poacher Lewandowski. The Bayern striker had a hat-trick goal ruled out for offside while the champions rode their luck at the other end, Kimmich brilliantly clearing a Reus shot off the line before substitute Paco Alcacer was halted by Jerome Boateng with the goal at his mercy. And they snatched all three points as Bayern's high defensive line was stretched again, Sancho robbing Franck Ribery to start a move that saw Axel Witsel send Alcacer through to chip Neuer. 73- Goal! Dortmund pull ahead! Sub Paco Alcacer chips the league leaders into the lead! 66- Goal! Dortmund level again! Marco Reus with a well-taken goal! 51- Goal! Bayern retake the lead! Lewandowski heads in from close range for his seventh goal in the Bundesliga! 47- Goal! Dortmund draw level from the penalty spot! Reus converts! 25- Goal! Bayern take a deserved lead! Robert Lewandowski plants a header into the back of the net! Twenty minutes to go at the Westfalen Stadion! Who do you think will win?!? I'm going for a jazzy score draw! 2-2! Now for Bayern! Muller replaces Arjen Robben who is out with a knee injury. Colombian midfielder James Rodrigez is on the bench. TEAM NEWS! First up Dortmund! The Big news is that keeper Roman Burki is out with a thigh injury. 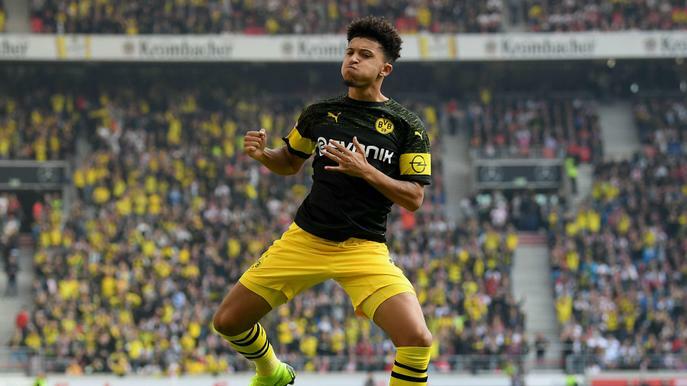 Jadon Sancho starts, although Paco Alcacer has to settle for a place on the bench! Bayern are in the building! Can Kovac's lads do the job in Dortmund? Dortmund will be up against a familiar face in Robert Lewandowski, who loves a goal against his old side, as beautifully outlined in this tweet from Bayern. Dortmund can go a mammoth seven points clear of Bayern at the top of the table, which is a huge motivation for Lucian Favre's young side. As you can see everyone is doing their bit ahead of Kick-off in an hour or so. Here is someone, erm checking the balls before the big game. It's always important to check the balls. So, here we are! Die Klassiker! Some big injury news for Bayern heading into the game. Winger Arjen Robben is OUT with a knee complaint. Bayern confirmed that he's back in Munich recovering. Good afternoon and welcome to the Live Updates for Borussia Dortmund Vs Bayern Munich! Dortmund can open up a seven-point lead over Bayern at the top of the table with a victory today. Join me for all the latest build-up, Team news & Goals as they go in! It promises to be a treat!